While browsing in the bookstore a few years ago, I came across this little book. I was intrigued by the cover because I love sunflowers. 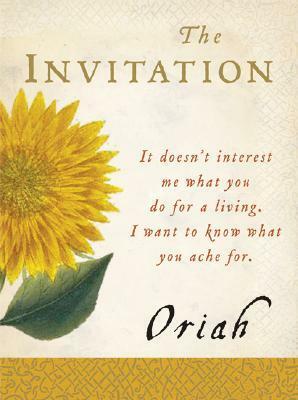 Then I noticed the author’s name Oriah and wondered if it had a meaning. It turns out that Oriah means “light of God” in Hebrew. I opened the book and saw the first line of the poem and I was hooked. At the time of coming across this book I had someone in my life who constantly felt the need to, in my opinion, brag about what other people had and what they did for a living. Great that he knew influential people, but I don’t care what other people have or have not, their occupation, or their status. I want to know people’s heart and go below the surface of a person to get to know who they truly are, not what they project. So, this poem came right on time for me. It doesn’t interest me what planets are squaring your moon…I want to know if you have touched the center of your own sorrow, if you have been opened by life’s betrayals, or have become shriveled and closed from fear of further pain. I want to know if you can be with joy, mine or your own, if you can dance with wildness and let the ecstasy fill you to the tips of your fingers and toes without cautioning us to be careful, to be realistic, or to remember the limitations of being human.